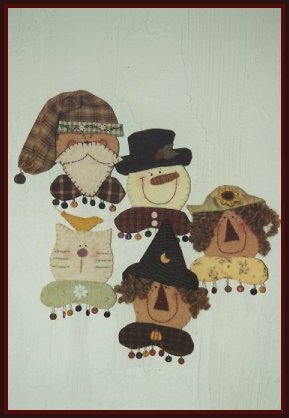 New rustic, primitive, folky stitcheries, needlepunch, patterns, kits, Santas, Angels, Annies, quilts, Patriotic motifs, Christmas, ornaments, more! 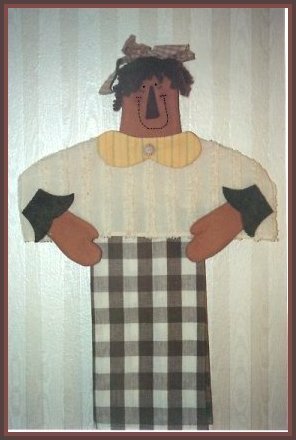 needlepunch, quilt wall hangings, pins, home decor, and more! 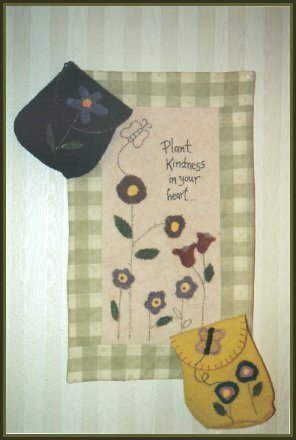 "Plant Kindness in your Heart..."
CJD 341 "Welcome To Our Patch"
A delightful banner to celebrate Fall! 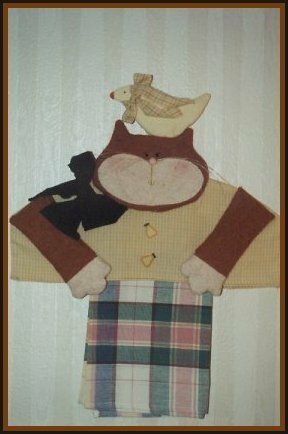 Use woolfelt and homespun flannels to create this adorable wallhanging. This is a GREAT idea! Use an ordinary hanger for this project. Wool felt, chenille fabric & dish towel from Wimpole Street, and homespun flannels from Moda. Annie Lou is at your service holding your dish towel. Easy to stitch. 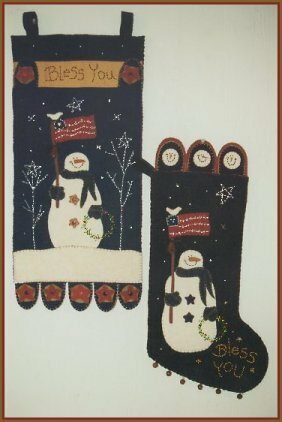 See this adorable snowman's partial smile peeping up from the wallhanging and purse. He'll melt anyone's heart! 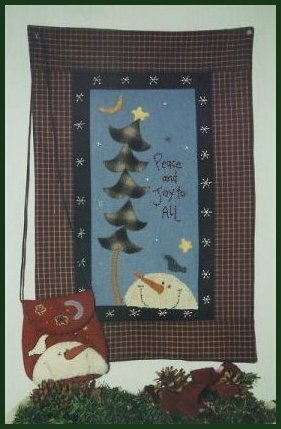 Wallhanging has a stitched saying, "Peace and Joy to All..."
Let Kris Kringle hang on to your dish towel or hand towel during the holidays.You and your guests will love this! Makes a GREAT gift. You'll love these festive pins and ornaments! It will put a smile on your face. 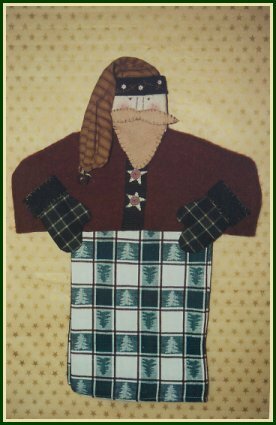 Use wool felt and homespun flannel remnants. Rustic blends buttons by Hillcreek Designs. Great colors of woolfelt used for the purse. 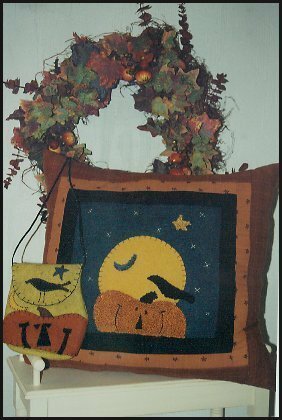 Adorable wallhanging with needlepunched pumpkin, crow & moon. Perfect for your next Autumn festivities. 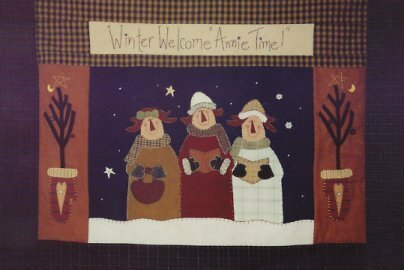 CJD 345 "Winter Welcome Annie Time!" Festive caroling Annies greet you with their irresistible charm. A warm welcome wallhanging for the Holidays! At your service! 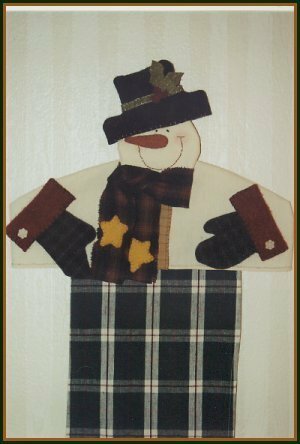 Mr. Jack Frost will adorn any room with his classic hat, smile and charm! Easy to stitch up, a great hit for your next holiday gathering. Let this feline paw its way to your heart! A resting bird on its head, and whiskers that will tickle your fancy! Quick and easy to stitch up! Makes a wonderful gift and a hot seller at the craft shows!